Landrace are white in color. Their ears droop and slant forward with its top edges nearly parallel to the bridge of a straight nose. 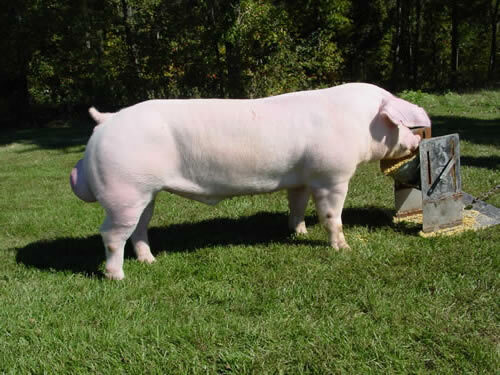 Landrace, which are noted for their ability to farrow and raise large litters, are the fifth most recorded breed of swine in the United States. The American Landrace descended from the Danish Landrace that had its origin in 1895. At that time the Large White Hog was brought from England and crossed with the native swine. After that infusion the Landrace was developed and improved by selection and testing. It was mainly through the use of Landrace that Denmark became the chief bacon-exporting country. To protect this position, Denmark for many years refused to export purebred Landrace breeding stock. In the early 1930s the United States Department of Agriculture entered into an agreement with the Ministry of Foreign Affairs in Denmark for the purchase of 24 Danish Landrace. This stock was to be used for swine research studies at agricultural experiment stations, with the stipulation that this breed would not be propagated as a pure breed for commercial use. During the 15 years following the original importation, Landrace were used in numerous comparisons with American breeds. As a result of this work, four new breeds have been registered by the Inbred Livestock Registry Association. In May of 1949, the USDA petitioned the Ministry of Foreign Affairs of Denmark to release its restrictions on the propagation of purebred Landrace in the United States. This request was granted, and the American Landrace Association was formed in 1950 to register and promote the sale of purebred breeding stock. Following the removal of restrictions on commercial use of Danish Landrace, the importations of Norwegian and Swedish breeding stock provided the outcrosses necessary for the expansion and development of the American Landrace breed of today. More than 700,000 offspring have been registered from the parent stock. The Landrace breed is promoted on its ability to cross well with other breeds. As well Landrace are known for their length of body, high percentage of carcass weight in the ham and loin, and ideal amount of finish. Landrace are prolific sows that farrow large pigs and which are exceptionally heavy milkers. These traits have designated the Landrace breed as "America's Sowherd".